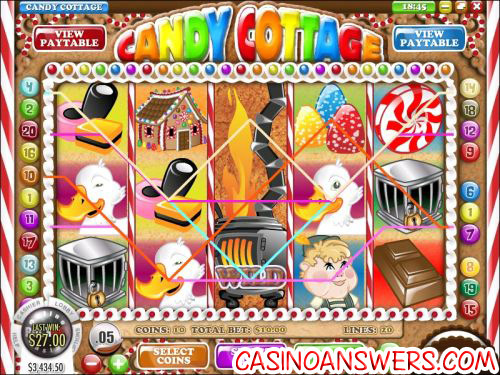 Candy Cottage Video Slot Guide & Review - Casino Answers! Candy Cottage is a 5-reel, 20-line video slot developed by Rival Gaming. It has expanding wilds, a free spins feature and a bonus game. You can play Candy Cottage at Bovada. Upon opening Candy Cottage, you will be greeted with an intro video. The video is a cartoon video of two kids who are wandering around a dark forest until they see a gingerbread house. Excitedly, they prance along and knock on the door, which is answered by a cackling witch. Of course, this is the popular Brothers Grimm fairy tale known as Hansel and Gretel. To play Candy Cottage, you must first choose your coin value. Coin values to choose from are $0.01, $0.05, $0.10 and $0.25. Then, pick the number of coins you wish to play (up to 10) and your number of active paylines (up to 20). You can bet as little as a penny per spin on Candy Cottage, and as much as $50 per spin. With that kind of range of available wagers, Candy Cottage is suitable for all types of online casino players. To spin using the settings you have set, hit the “Spin” button. To play Candy Cottage with all 20 lines active and betting all 10 coins at your selected coin value, hit “Bet Max.” Candy Cottage also has an autoplay mode available. All wins in Candy Cottage are mutliplied by the number of coins bet per line, except for scatter wins. All lines pay from left to right, except for scatters, which will pay any. Only the highest win on a payline will be paid out. Candy Cottage features expanding wilds. The wild symbol is the hot stove symbol. It only appears on the third reel. When it does appear, it will expand to cover the entire third reel and complete any possible winning combinations. The stove symbol does not pay out by itself. Candy Cottage has a free spins feature. This is triggered when three or more gingerbread house symbols appear anywhere on the reel. When this happens, you will win 10 free spins and a 3X multiplier. This means that for those 10 free spins, all of your winnings will be tripled. You can win these free spins at Bovada. With video slots like Candy Cottage, Rival is quickly becoming one of the best casino game providers for game quality. While they don’t have the largest number of games, slots as good as Candy Cottage are few and far between. We often write about how great some of the Rival iSlots like Heavyweight Gold are, but Candy Cottage is right up there with any of them. For a $10 no deposit bonus and a 100% up to $500 signup bonus to play Rival Gaming video slots like Candy Cottage, sign up today at Cocoa Casino! Where can US-based players play the Candy Cottage slot machine? Unfortunately, American players are no longer permitted to play at Rival online casinos for real money. Instead, we invite you to play at Slotland Casino. For an in-depth look at Vegas Days Casino, you can read our Vegas Days Casino Review. Does Candy Cottage have a bonus game? Yes, when you hit three bonus symbols, you will trigger Candy Cottage’s bonus game. In the bonus game, you play as the Hansel character. You must move Hansel from side to side using your mouse as candy falls from the top of the screen. The more candy you collect (or eat), the more winnings you will receive. The bonus game is skill-based, so be ready to move your mouse and pick up as much candy as you can! 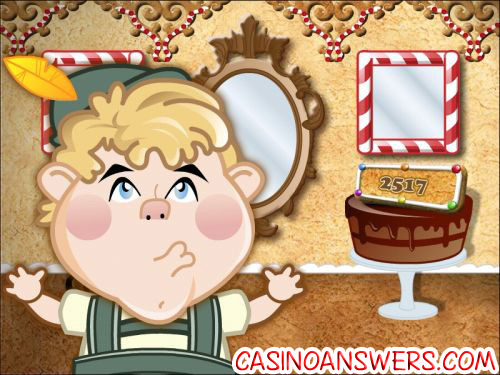 How do I activate the Candy Cottage slot machine bonus game? Is Candy Cottage an islot?